Botox, facial fillers, and lip injections are often viewed as safe alternatives to invasive plastic surgery that involves going under the knife, but that isn't necessarily the case. All of the beforementioned injectables have a number of possible side effects associated with them. 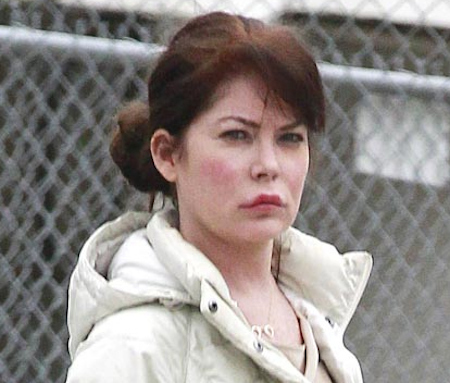 Throughout the years, Lara Flynn Boyle has been the subject of countless cosmetic rumors, sporting the prototypical puffy face and pouty lips. Its believed that her artificial substance of choice includes facial fillers (Restylane, Juvederm or Sculptra) and lip plumpers (Collagen). Now we see how she currently looks in 2012. Is Ms. Boyle's present day appearance the result of side effects, and ultimately the discontinued use of these fillers? Or has the actress sought some type of corrective procedure to repair the damage caused by years of using these injectable fillers? Presumably speaking, of course. Wow. What has happened to her? She looks awful. She used to be so pretty. Her looks are ruined now. I think she had silicone Injections bc they're permanent. I went to "plumping party" in 2001 and had a little bit injected into lips and cheeks. It was done by a nurse who worked for a plastic surgeon, and she used the right silicone. It looked really good, so my mom and girl friends came with me to another party and had injections too. Fortunately, the nurse kept the injections to a minimum, and would tell people if they were asking for too much. It's 12 years later, and I'm still happy with results, and thankful that I didn't go to a greedy, unscrupulous nurse or doctor. I know I dodged a bullet on that one. To me, it looks much more like she's swollen from weight gain due to taking prednisone or some other type of steroid.